Here we have a lighter version of my Summer Berries necklace. 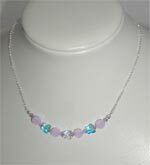 This necklace is made of sterling silver chain complete with a clasp.It is 15" long including a 3" run of dazzling swarovski beads.These delicious subtle sherbet coloured beads are perfect for this seasons key trends of femininity and romance. I have used AB coated pink beads to give a modern illustrious feel combined with some of my favourite beads called violet opal which have a ghostly feel to them and a hint of violet.To add to the feminine look I incorporated 8mm AB coated swarovski butterfly beads.As you can see they pick up different colours when at different angles. I can picture this necklace being a great accessory for a summers day, or even a wedding.